Put some pizzazz in your formal wear with the Gear Tie Clip from Tateossian. 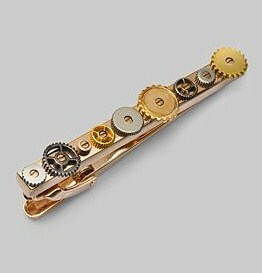 A series of various sized metal cogs and gears adorn this unique tie clip. Just snap it on your favorite tie with the hinge closure, and you’re sure to get a few looks and comments. This will definitely bring a little steampunk flare and character to your regular formal attire.